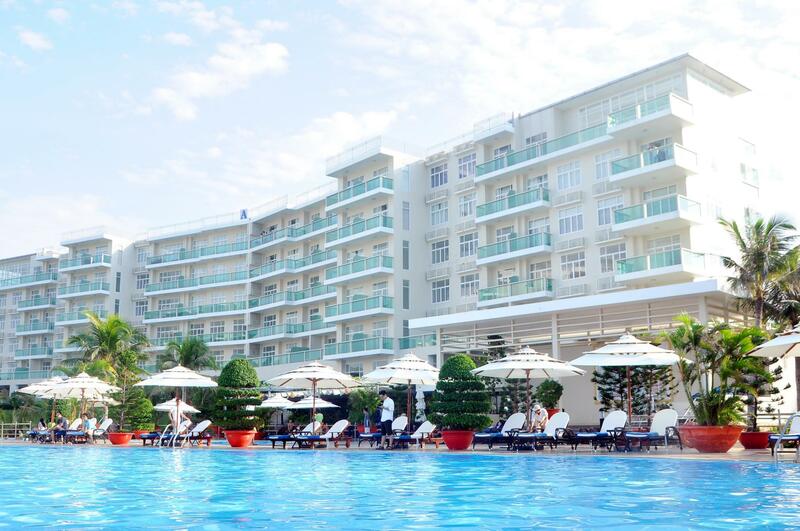 Heeft u een vraag voor Ocean Vista Resort & Residence Mui Ne? Met een gunstige locatie in familievermaak, stranden, bezichtiging van bezienswaardigheden in Phan Thiet, biedt Ocean Vista Resort & Residence Mui Ne u een zeer aantrekkelijke plek om even te ontspannen in drukke tijden. De accommodatie ligt 12 km van het stadscentrum en de belangrijkste voorzieningen zijn dus goed bereikbaar. Dankzij de praktische ligging, biedt de accommodatie eenvoudig toegang tot alle belangrijke trekpleisters van de stad. Ocean Vista Resort & Residence Mui Ne biedt een onberispelijke service en alle essentiële voorzieningen om vermoeide reizigers een verkwikkend verblijf te bieden. Terwijl u in deze geweldige accommodatie verblijft, kunt u genieten van gratis wi-fi in alle kamers, dagelijkse schoonmaak, cadeau-/souvenirwinkel, 24-uur beveiliging, rolstoelvriendelijk. Gasten kunnen kiezen uit 102 kamers, welke stuk voor stuk plezierig en comfortabel zijn ingericht. De recreatieve faciliteiten van de accommodatie, inclusief windsurfen, kano, skimateriaal verhuur, mini golfbaan, hot tub, zijn ontworpen voor maximale ontspanning en onthaasting. Ocean Vista Resort & Residence Mui Ne is een ideale verblijfsplaats voor reizigers die charme, comfort en gemak in Phan Thiet zoeken. Gasten betalen aan de accommodatie bij het inchecken. Personally for us, we loved all the amenities that this hotel had: gym, sauna, 2 huge swimming pools, 2 tennis courts, children learned how to surf on the surfing board. We had an unbelievable active time. The beach was also very nice and clean. The only shortcomings were that the staff speaks in a very poor english, and for some reason there was no washing machine even for family suites, it was rather uncomfortable since we stayed for a long time. Great service, very clean, nice facilities for families, great pool area. The food in the restaurant not very tasty and yet relatively expensive, and the breakfast was only ok, although there were lots to choose from. Staff are nice, friendly, responsive, helpful. Huge room, well equipped kitchen. Swimming pool is nice and big. Great spa services with sauna and steam room. Great choice with the combo offered (dinner with a glass of red + 60 mins spa) Breakfast is awesome and absolutely delicious. HIGHLY RECOMMENDED. I WILL DEFINITELY COMEBACK. We stayed 2 nights for the 3-bed-room apartments. The view is stunning - big balcony with sea view, full kitchen stuff for our parties. 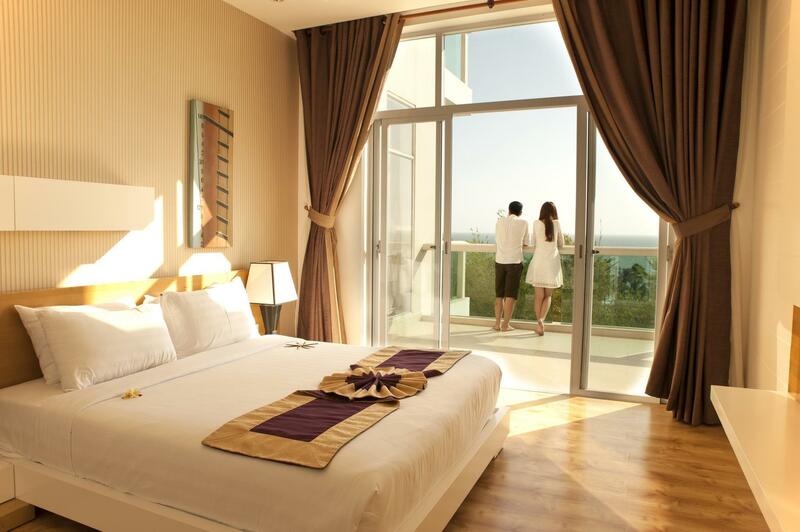 Staying at the apartments, you have all hotel/resort services like pool, gym and sauna. Even, there is dedicated pool at the apartment area as well. One thing, using hotel/ resort service, we have to take tuk tuk for transportation from apartment. Overally, highly recommend for group or family that love cooking and sea view enjoying. Everything is excellent! Location, Staff’s altitudes are perfect just one small thing need to improve ( one light inside the main swimming pool is broken and it is not safe.) Next time we’ll comeback. We totally fell in love with this place. We stayed here for a month being a family of 4 people. We’ve had the opportunity here to play tennis , learned how to surf in the sea. Staff is very friendly even though their level of English needs to be improved. The beach was clean, and both swimming pools were great. The only minus is that somehow for family suites they don’t have neither washing machines nor iron. But generally we loved this place. We booked the 3-bedroom suite for our group. The facility is so poor with chipped bathtub, dirty walls, leaking faucet, etc. The toilet seat didn't stand; my husband had to hold the toilet seat while he used the toilet. It is just terrible. When we were ready to take a shower, there was hot water. After three phone calls, their repairmen final came. They claimed that they had checked the hot water before. They said that they could not fix it right away; the manager offered to move us to another room. We were too tired to move! We waited for one hour for a group of three men to finally fixed the hot water problem. The following morning we went to the beach, the hotel's towel service at the beach ran out of towels. Then, it was time to check out, and the hotel took 20 minutes to "check" the room. We didn't enjoy the hotel. Stay away! Large apartment with 3 bedrooms. 1 master bedroom have a giant bed. 2 standart bedroom with queen size. Nice open kitchen. Nice bathroom. Large living room. Have very large balconies. We can use all of the facilities if we use "orange bracelets" means we all must declare how much peoples stay with us. Nice swimming pool. Nice kids play area. Nice fitness area in outdoor space. The beach in front of the apartment area. Only cross the street. Private Beach only for This Property. A lot of various foods for breakfast. It's great residence to stay. The best and only appart hotel in Muine we know. Apartments are specious, clean and cosy. But service and especially kitchen during last years became much worse. To the management - please do smth with your kitchen, breakfast is not tasty any more, Restaraunt food for room service is awful, especially meet dishes and pizza (that’s not a pizza in fact). The beach seems to be not cleaned any more, staff on the beach is lazy and you never can find them. Pools are nice, but water is not very clean. Unfortunately the place now is max 2* now, not 4* anymore. Staff were most of the time absent minded. When I first asked about bus schedule they just looked at me blankly and asked me if I need to book a private car. Thankfully last day a gentleman sorted everything out with a couple of quick phone calls. I will book this hotel again if I go there in the future! The location is nice. The staff is nice. The breakfast won't disappoint you. And the swimming pool..wow..too good to be true!! Everything is perfect! We absolutely loved our stay here. Excellent facilities rite near Han Tien and across the road from the beach. The buffet was lovely and always great cleaning service with suitable kitchenette. Staff very helpful and excellent facilities with nice restaurants just a scooter ride away. Will come back again. We go to Mui Ne often and this is the best hotel we stayed so far. The staff is very kind and helpful. They have shuttle carts and drive you around as the resort counts another hotel with a huge pool well adapted for kids, some Villas, at least two nice kids area with many toys (look new), a Wine Castle and more. Food was excellent and very affordable. The kids room is right next to the dinning room, so kids can play as you enjoy your meal. The room (6th floor for ours) was a small apartment with all you need to cook, great to cook the meal for the baby. Nice and clean with a large balcony. I must also add that there was NO musquitos compared to the other places we've been. The only down side is the beach. Lots of small pieces of wood in the water. Although it's only in the first meter, it is not so good for young kids who are playing in this first meter. Past this point, it's just as nice as everywhere else. we traveled 2 days 1 night in the hotel. it is very clean hotel above my expectation. the things are brand new, the bad are extremely clean and the restaurant seems to be no scratch. rooms are big, really big, furniture are good quality, not like the cheap things used for the short-time. i love the design of the room. the people are so nice. they are helpful everywhere we go and there are many people standing in the points for us to ask about anything. people look good, both boys and girls. :) we had good food in the lunch because we came at the hotel about 2h. Breakfast are very various, taste good and are kept warm and clean. Drinks are also good. My father loves soja milk, it is tasty and my mom loves joguhrt. in short, it is good, just on the beach there is no tower on the chair as they told us and the room need to be opened before guests come for the smell. Spacious room. Good break fast. Helpful staff. Family room is a good choice for big family as the room is very spacious. However the bed is standard for 2 adults, children need extra bed. Very good and multi-choice breakfast. There is a kindergarten next to the restaurant with a nanny. Really good for parents enjoy the time there. Fantastic rooms - Icean view recommended if budget allows & breakfast amazing. The omission of a washing machine (despite available taps for one) was disappointing. Staff very helpful. Private beach great. Lunch menu would have been better to offer Banh Mi rolls rather than. Everything with fries. First of all, the apartment we stayed was nothing like the photos. It was quite spacious but the interior was old and cheap. I've stayed at other resorts in Mui Ne and honestly this one is not worth the time or money. The location doesn't justify the price due to terrible facility. We asked for extra towels but they refused because "they did not have enough towels to provide for the whole resort" ??? Also, there are bugs, ants and insects flying around, so close your windows and be careful when you sleep. I was luckly to not get bitten by mosquitoes. If it wasn't because we were travelling in a group and there wasnt any acceptable airbnb in town, we'd never choose this place. Definitely my last visit!